← Lets hit the books : Planned Coming Book Reviews! 1 tbsp. of Montreal Steak Spice. Now I love Venison but some folks can find its fuller flavour a challenge, This stew was served for company and seconds were requested all round. Its not a fast dish, so make it on a day that you have the time to do so.. it will be worth it! Put a touch of oil in your pan and cook your onion, garlic till clear with brown edges, then add your meat and brown it on both sides, add stock and bay leaves and simmer at low-med heat for at least a hour. Then add everything else on the list and slower the heat and let it simmer together for an hour but two is even better.. Mine took a total of four hours of slow simmer before it was served with fluffy Baking Powder Biscuits. 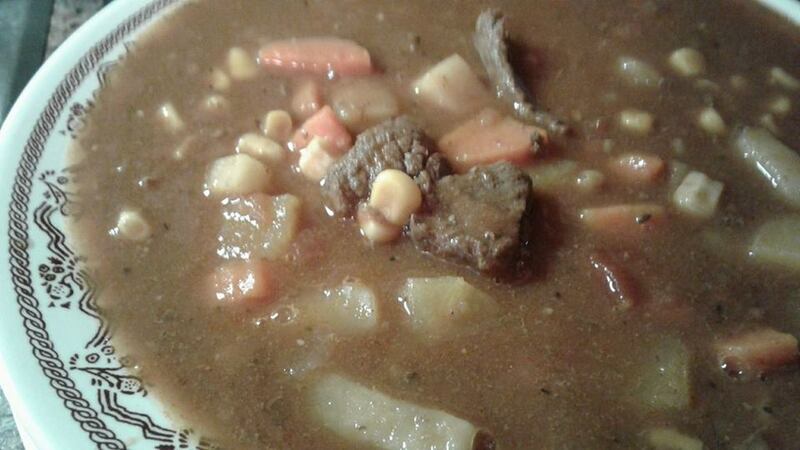 This entry was posted in Soups and Stews and tagged fall stew, stew, veggie stew, Venison Stew. Bookmark the permalink. You always make me so hungry!!! !